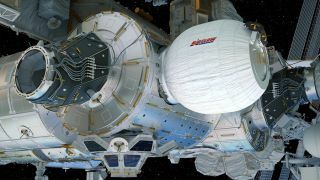 This artist's illustration shows the Bigelow Expandable Activity Module (BEAM) built by Bigelow Aerospace as it will appear once fully inflated on the International Space Station. NASA and Bigelow Aerospace will try to inflate the module on Saturday, May 28, after calling off their first try on Thursday. Editor's note: This story was updated at 7:25 p.m. EDT on May 27 to give the time of Saturday's attempted BEAM inflation, which NASA had not previously announced. NASA will try again to inflate the International Space Station's new experimental habitat this Saturday (May 28). NASA called off the first attempt to pump up the Bigelow Expandable Activity Module (BEAM) on Thursday (May 26), after noticing higher-than-expected pressures inside the habitat. But that issue was likely just a result of BEAM's fabric layers sticking together, NASA officials said, expressing optimism that things will get ironed out soon. The next opportunity will come at 9:00 a.m. EDT (1300 GMT) on Saturday, NASA officials said. You can watch the event live here at Space.com, courtesy of NASA TV; coverage begins at 8:45 a.m. EDT (1245 GMT). BEAM was built by Nevada-based Bigelow Aerospace. The module arrived at the International Space Station (ISS) last month aboard SpaceX's robotic Dragon cargo capsule, as part of a project to test how well expandable habitats — which provide greater internal volume per unit of launch mass than conventional rigid modules do — perform in space. Specifically, NASA wants to see how well BEAM protects against solar radiation, temperature extremes and micrometeorite strikes over the course of two years in orbit. When fully inflated, BEAM will be 13 feet (4 meters) long and 10.5 feet (3.2 m) wide, and will provide 565 cubic feet (16 cubic m) of internal volume. But the module got to the ISS in a highly compressed state, measuring about 7 feet long by 8 feet wide (2.1 by 2.4 m). It had been sitting in this packed configuration for 15 months — 10 months longer than originally planned, thanks to launch delays — before deployment activities began, Bigelow representatives said. That extra time in a tight squeeze might explain why the first inflation attempt didn't go as planned. BEAM's Kevlar-like fabric "layers have a memory to them," Lisa Kauke, BEAM deputy program manager at Bigelow Aerospace, said during today's teleconference. "The longer they're packed, the more they're compressed, and then it takes a little while for the shape to return." This interpretation is bolstered by the fact that BEAM continued to expand overnight Thursday into Friday morning, even though no more air was being pumped in, Crusan said. BEAM was partially deployed Thursday, and NASA plans to de-pressurize the module today before trying to pump it up again on Saturday. These activities "can only be helpful in allowing those materials to have some time to relax," Kauke said. Both BEAM and the International Space Station are in good shape, NASA officials said. The initial inflation attempt was halted out of an abundance of caution, agency officials added, explaining that they didn't want to unduly increase loads on the module-connecting interfaces of the ISS. BEAM is in a safe configuration, and the module is designed to survive for years on orbit. So there will be other chances to expand the habitat even if Saturday's attempt fails, NASA officials said. However, the next try after that might have to wait until Thursday (June 2) to accommodate some already-planned activities aboard the ISS. "I think the team feels pretty strongly that we're going to get there with the concept and the plan that's currently laid out," said Kenny Todd, the space station's mission integration and operations manager. "We've just got to work our way through it."